Farewell Spit Eco Tour is the only way to visit the the most popular attraction in Golden Bay, the Farewell Sand Spit extends from the northern tip of the South Island and reaches eastward into the Tasman Sea. 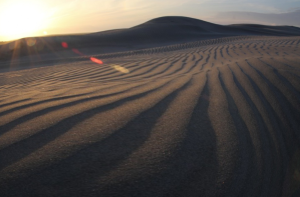 A spit is a peninsula formed as sand and other deposits are heaped by sea currents, but Farewell Spit is no mere pile of sand. It is 1.5 kilometers wide and over 25 kilometers long. It is the longest sand spit in New Zealand, but the distinctions don’t stop there. Farewell Spit lends itself to diverse ecosystems and breathtaking views teeming with wildlife. 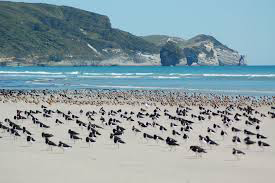 It is a designated seabird and wildlife reserve and therefore closed to the public except through organized tours offered since 1946 through Farewell Spit Eco Tour. Farewell Spit Eco Tour departs from Collingwood near the Station House Motel and take guests, by bus, to the reserve entrance. The buses are unique, designed to traverse the fine sand and other natural obstacles that occur in some areas of the spit. From there, a leisurely 41/2-5 hours of unique scenery, exposure to wildlife and once-in-a-lifetime moments await, all intertwined with a comprehensive history of the area parlayed by knowledgeable tour guides which makes the trip worth every penny. Departure times are determined by the tide so they vary widely, but whether you will be leaving at sunrise or returning home while the sun begins to set, bring a camera; there are plenty of stops and sights you will want to record for posterity. From the sandy and wind-ravaged north side where the landscape shifts at the whim of nature, to the lush green south, the spit offers a kaleidoscope of experiences. 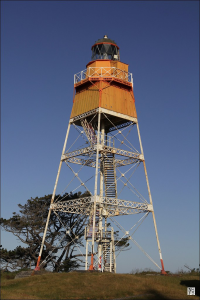 At the northern end of Karamea Bight stands the Kahurangi Point Lighthouse, a 27 meter structure which has served as a maritime landmark since 1870. Unmanned and automated since 1984, it is guarded by an impressive windbreak of macrocarpa pines. The Farewell Spit Eco Tour stop at Fossil Point where an ancient world is revealed through exposed fossils, plentiful and evident, embedded in age-old rock. Sand hill climbs offer panoramic views of ocean beaches. Coastal cliffs at Cape Farewell are a place of nearly magical wonder; fault lines cut through the rock walls creating striking visual patterns and the streams there run inland instead of toward the sea. When the tide is low, the spit is aproned by gleaming mud flats. A climb up the dune at Mullet Channel offers a view of a tidal plain where droves of migratory waders from the Arctic Circle stop seasonally to feed. Bird watching and seal watching enthusiasts will find plenty to view. There are over 80 species of birds on the spit. 5000 birds at any one time inhabit Farewell including colonies of gannet, heron, oystercatchers and little blue penguins. Seals, adults and pups, are plentiful as well and can often be seen sunning themselves on the beaches. All aspects of nature project a stunning presence on Farewell Spit. A relaxing yet invigorating experience awaits onthis jewel of New Zealand. Book a Farewell Spit Eco Tours with The Station House Motel you receive a discount off your accommodation. To view The Farewell Spit Eco Tour website, please click here.